There was never going to be enough time to build stuff before Christmas, so I’ve been making use of my holiday time instead. There was many Lego received (with gratitude and jaw splitting grins) so for most of the last week I’ve been enjoying ‘morning Lego’. It followed quite naturally on from the Lego Star Wars Advent Calendar, but with greater complexity and schinkling. We tend to get into epic length breakfast when I’m not at work, so I’ll often find myself still in pajamas with a box of Lego and croissants at about half past two. This is a good thing. Overall this year’s advent calendar was pretty good, though there’s a depressing focus on the prequels (or “fan films” as we’ve taken to calling them). 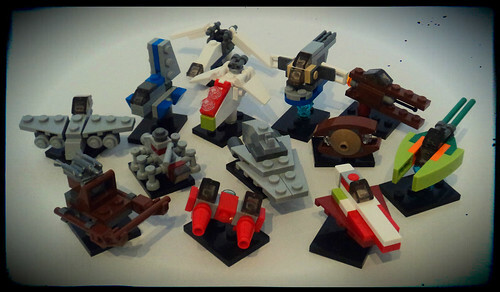 So I only vaguely recognise most of the mini vehicles we’ve built. Despite that most of them are very neat little builds, with a couple of ridiculous exceptions – the lame seagull ship (at the back) being one of them. There were of course new versions of the Star Destroyer and Slave I, though the latter is just a slightly less interesting version of last year’s. They’ll soon be stripped down for parts in any case because as usual there is a nice scattering of the dark reds, bright greens, lots of lovely tiles (including a load of 1×1 slopes which I cannot resist), nice multi-studded connector bricks and the unusual dark green bars. A very pleasing bonus of these advent calendars is the number of spare studs and slopes you get right through the month. Sure – this would be a crazy way to buy new Lego but it’s a bit like a Kinder egg, without the disappointment and gender bias. 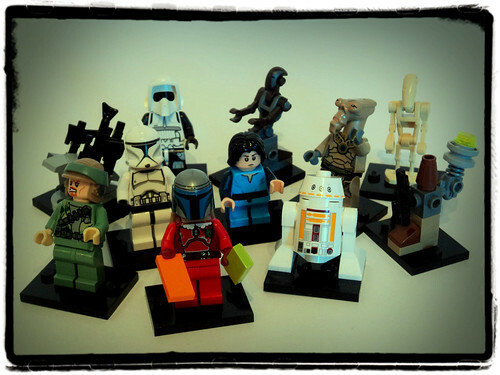 As ever the real joy was in the minifigures – 9 new figures in all. That does include yet another battle droid, and a more interestingly coloured fellow on caterpillar tracks (a cool use of the body which had never occurred to me) – I’m sure he’s instantly familiar to a seven year old. A new Clone Trooper, and a Biker Scout, plus an Endor Rebel with a good scowly face made me quite happy. There’s also a young Boba Fett (who will be mined for parts immediately), a weird-noggined Geonosian chap (I think), Christmas Jango Fett and the R5 droid I really wanted. I do like the obsession with supplying weapon racks for the minifigures though, and the Geonosian-style setup is a nice use of parts. These are the minifigs I was looking for. If you can pick the set up for a tenner there’s probably enough to keep you happy. I can barely resist the Star Wars calendar, but in retrospect the Lego City was a stronger set with far weirder builds (the astronaut with a wand for example). I was also tempted by the Lego Friends set, for the marvellous colours. Roll on next Christmas..!